Following notes written by an English traveler in the early 19th century and two French pilots in the 1950s, Pierre Tallet made a stunning discovery: a set of 30 caves honeycombed into limestone hills but sealed up and hidden from view in a remote part of the Egyptian desert, a few miles inland from the Red Sea, far from any city, ancient or modern. During his first digging season, in 2011, he established that the caves had served as a kind of boat storage depot during the fourth dynasty of the Old Kingdom, about 4,600 years ago. Then, in 2013, during his third digging season, he came upon something quite unexpected: entire rolls of papyrus, some a few feet long and still relatively intact, written in hieroglyphics as well as hieratic, the cursive script the ancient Egyptians used for everyday communication. Tallet realized that he was dealing with the oldest known papyri in the world. Tallet has been toiling quietly on the periphery of the ancient Egyptian Empire—from the Libyan Desert to the Sinai and the Red Sea—for more than 20 years without attracting much notice, until now. He finds it both amusing and mildly annoying that his discoveries are suddenly attracting attention in the scholarly press and popular media. “It’s because the papyri are speaking of the Pyramid of Khufu,” he says. On a clear day you can see the Sinai Desert about 40 miles away across the Red Sea from where we stand. Before these recent excavations, the ancient Egyptians were not widely known to be notable sea travelers, and were thought to confine themselves to moving up and down the Nile or hugging the Mediterranean coast. The work that Tallet and others have done in the last two decades has shown that the ancient Egyptian Empire was as ambitious in its outward reach as it was in building upward in its colossal monuments at Giza. Tallet, a short, almost bald man of 49, wears wire-rimmed glasses and, on this day, a tan wool sweater vest. He looks like someone you would be more likely to encounter in a Paris library or office than in a desert camp. Indeed he is soft-spoken, choosing his words with scholarly scruple and carefully citing the contributions of other scholars, and he likes working in remote locations far from the hubbub at the monumental sites, royal tombs and palaces and necropolises that have generally captured the world’s attention. “What I love are desert places,” he says. “I would not like to excavate places like Giza and Saqqara.” (Saqqara is where early Egyptian pharaohs built some of their tombs before beginning the pyramid complex at Giza.) “I am not so fond of excavating graves. I like natural landscapes.” At the same time, he has professional reasons for preferring remote sites over famous monuments. “Most new evidence is found in the periphery,” he says. 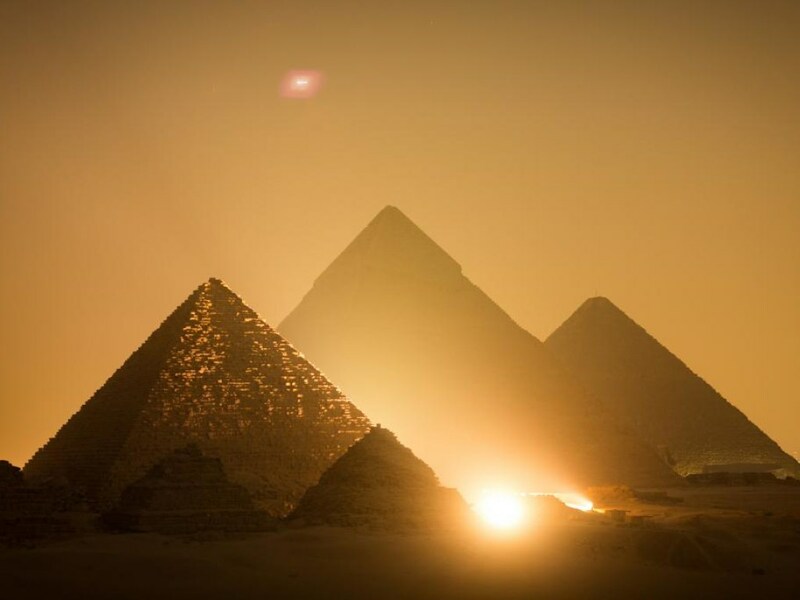 Today, the Great Pyramid is tinted by smog and pollution, but when it was first built, the sanded limestone used to make it would have shone magnificently. Tallet is convinced that harbors such as Wadi al-Jarf and Ayn Soukhna served mainly as supply hubs. Since there were few sources of food in the Sinai, Merer and other managers were responsible for getting food from Egypt’s rich agricultural lands along the Nile to the thousands of men working in the Sinai mine fields, as well as retrieving the copper and turquoise from the Sinai. In all likelihood, they operated the harbor only during the spring and summer when the Red Sea was relatively calm. They then dragged the boats up to the rock face and stored them in the galleries for safekeeping until the next spring. Working on the royal boats, it seems, was a source of prestige. According to the papyri found at Wadi al-Jarf, the laborers ate well, and were provisioned with meat, poultry, fish and beer. And among the inscriptions that Tallet and his team have found at the Wadi al-Jarf gallery complex is one, on a large jar fashioned there, hinting at ties to the pharaoh; it mentions “Those Who Are Known of Two Falcons of Gold,” a reference to Khufu. “You have all sorts of private inscriptions, of officials who were involved in these mining expeditions to the Sinai,” Tallet says. “I think it was a way to associate themselves to something that was very important to the king and this was a reason to be preserved for eternity for the individuals.” Clearly these workers were valued servants of the state. The work that Tallet and his colleagues have done along the Red Sea connects with Lehner’s work at Giza. In the late 1980s, Lehner began a full-scale excavation of what has turned out to be a residential area a few hundred yards from the pyramids and the Sphinx. For centuries, travelers had contemplated these amazing monuments in splendid isolation—man-made mountains and one of the world’s great sculptures sitting seemingly alone in the desert. The paucity of evidence of the substantial number of people needed to undertake this massive project gave rise to many bizarre alternative theories about the pyramids (they were built by space aliens, by the people from Atlantis and so forth). But in 1999, Lehner began uncovering apartment blocks that might have housed as many as 20,000 people. And many of the Giza residents, like the boatmen at the Red Sea, appear to have been well-fed. Judging by remains at the site, they were eating a great deal of beef, some of it choice cuts. Beef cattle were mostly raised in rural estates and then perhaps taken by boat to the royal settlements at Memphis and Giza, where they were slaughtered. Pigs, by contrast, tended to be eaten by the people who produced the food. Archaeologists study the “cattle to pig” ratio as an indication of the extent to which workers were supplied by the central authority or by their own devices—and the higher the ratio, the more elite the occupants. At Lehner’s “Lost City of the Pyramids” (as he sometimes calls it), “the ratio of cattle to pig for the entire site stands at 6:1, and for certain areas 16:1,” he writes of those well-stocked areas. Other, rather exotic items such as leopard’s teeth (perhaps from a priest’s robe), hippopotamus bones (carved by craftsmen) and olive branches (evidence of trade with the Levant) have also turned up in some of the same places, suggesting that the people who populated Lehner’s working village were prized specialists.